Living a Fit and Full Life: Monitor Your Home's Security with EZVIZ's New Mini Trooper Wire-Free Indoor / Outdoor Security Camera System! Monitor Your Home's Security with EZVIZ's New Mini Trooper Wire-Free Indoor / Outdoor Security Camera System! Check in on your kids to know that they’re safe, watch and listen to pets, or have peace of mind and keep an eye on your home. Motion alerts instantly pop up on your smartphone when movement is detected, from the smart home enabled EZVIZ app. The Mini Trooper delivers unrivaled HD quality via our patent pending High Dynamic Algorithm Video (HDα) technology. Driving our optimal HD video quality are proprietary technologies that deliver better compression and quality including Predictive Encoding, Digital Video Noise Suppression and Extended Bitrate Modulation. Mini Trooper also has 116 ° wide-angle lens and up to 25’ of night vision. Weatherproof with absolutely no wires so you can place it anywhere you want, indoors and outdoors. You can put it in a tree to see your front porch or other hard to reach places where a wired camera can’t reach. Use direct voice commands to ask Alexa (Echo Show) to show you the front door or monitor the baby’s room. Simply just say “Alexa, show me (name) camera.” EZVIZ cameras is always getting smarter and adding new skills. Monitor your home's security with EZVIZ's new Mini Trooper Wire-Free Indoor / Outdoor Security Camera System! 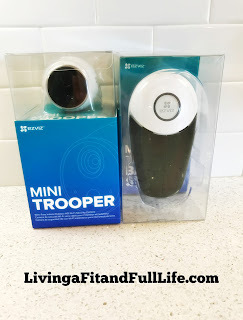 EZVIZ's new Mini Trooper Wire-Free Indoor / Outdoor Security Camera System is absolutely perfect for all homes and I was completely blown away at how easy this security camera system was to set up. Since it's wire free I was able to get it set up and ready for use withing minutes. I love getting motion alerts every time there's any activity going on near the camera. The alerts pop up on my phone and I'm able to view them right then and there to make sure all is well. The picture is extremely clear and even the sound sounds amazing on this security camera. If you've ever thought about getting a security camera, this one is absolutely perfect. You can also add up to 6 Mini Trooper Cameras to monitor different areas should you have more than one area that needs monitoring. The EZVIZ Mini Trooper Wire-Free Indoor / Outdoor Security Camera System even works with Alexa! EZVIZ's new Mini Trooper Wire-Free Indoor / Outdoor Security Camera System has it all and I highly recommend it! 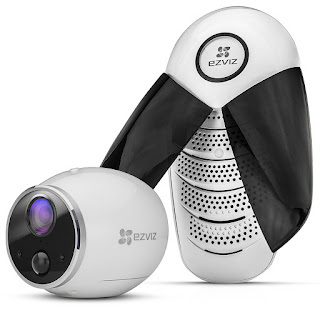 Click HERE to find a store near you that sells EZVIZ products! Click HERE to learn more about EZVIZ! Follow EZVIZ on social media!